Mary DiNunzio works for and is a partner of the law firm Rosato & DiNunzio. While the firm deals in general law her specialty is dealing with children with learning disabilities who have been let down by the education system by their not providing for their special needs.Under the Individuals with Disabilities Education Act, a federal law, students with learning disabilities are entitled to an education that meet their needs at no cost. This was the fourth book of the Rosato and DiNunzio series, but the first book of Ms. Scottoline thaty I've read. I didn't feel lost, but I'm sure I lost some of the magic, cohesion, and nuances of the relationships that exists when you've been acclimated to them in previous books. 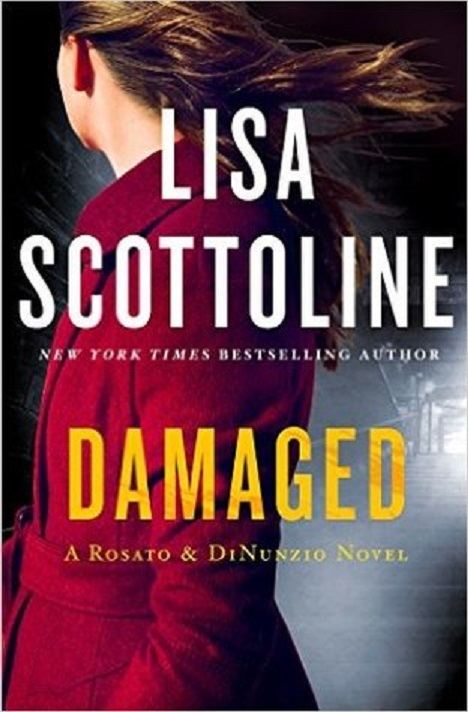 The series centers around the people and cases that the folks at the law firm Rosato & Dinunzio take on. 'Damaged' was a quick paced roller coaster of a read with a snowball effect that kept gaining momentum, speed, and mass as the story sped towards the ending. Every time you thought Patrick's situation couldn't get any worse, Ms. Scottline threw another roadblock into the mix escalating things and making the reader believe there was no way a happy ending could ever come about. Twists and turns were plentiful, and if you blinked you might just miss something. Besides the drama and suspense the story induced, the author was able to educate the reader in an entertaining way about what rights families have when it comes to educating a child with special education needs. I wish I'd read her book years ago for then I'd know about the federal law which requires schools to meet the needs of children with learning issues. My daughter was diagnosed with an auditory processing disorder that required very little of the school. They refused to agree to providing her with a teacher who regularly gave spelling tests so I yanked her out and put her into private school. Had I known about the Federal law I could have been reimbursed for the cost of that school or, what I would have preferred, forced their hand to make them accommodate her. Seriously, asking for regular spelling tests was too much of a bother? Truly? For the record, my daughter graduated in the top 11% of her high school class with honors and is in her second semester of college where she's twice made the Dean's list. Overall, I gave this one 4 out of 5 roses. It was a lovely combinations of mystery, drama, and suspense wrapped around some information we all should know. Plus, I liked how all the characters appeared three dimensional. The story engaged my emotions and made me wonder how the poor kid would ever get out of the mess he'd been dropped into. Plus, I really liked Mary and how she championed Patrick. I just might have to read the rest of the series.